The basic rule, to ensure safety, is a 3 to 1 ratio must be used on any item moving in any direction where brakes are being applied and G-forces occur. 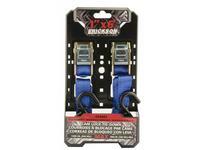 It is the responsibility of the user to determine the number of straps needed to secure his load safely based on the SWL rule. SAFE WORKING LOAD LIMIT (SWL) is one-third (1/3) of the break strength. 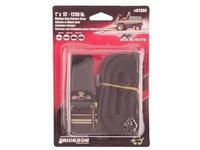 ERICKSON MFG. 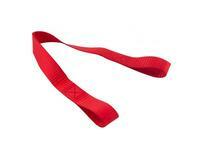 LTD. is a member of the Web Sling Tie-Down Association. All straps are sewn to the Association’s specs. 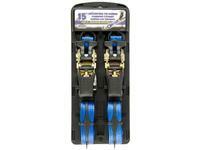 All straps have the associations certificate sewn in, along with the maximum and safe work loads. HEAVY DUTY PROGRAM ONLY, STARTING WITH ERICKSON'S 5000 LB. STRAPS. 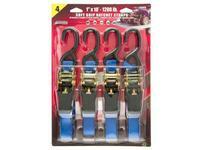 Value Pack 1" x 10' - 500 lb. 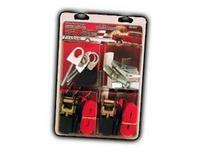 Ratchet/Stake Pocket Anchor Combo #01017. 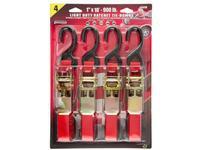 Kit contains (4) #01011 toggle anchors which fit all new full size pickups, Ford, Dodge, Chevy. Also comes with (2) 10 ft. (500 lb.) 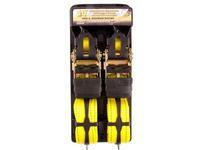 ratchet straps. 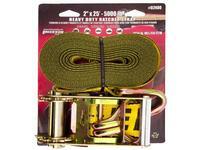 Ratchet Strap 2" x 25' - 5000 lb. with a 1650 lb. SWL Ratchet Strap. 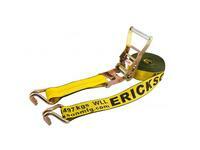 Erickson ratchet stampings are made from high carbon steel, heat treated, and yellow dichromate plated, making this ratchet strap the best in it league. 2" x 25' - 5000 lb. 1650 lb. 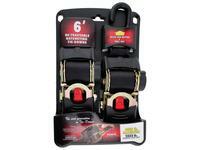 SWL Ratchet Strap,features a wide handle mini ratchet. 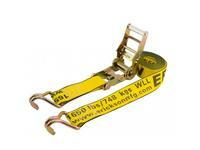 All ratchet stampings are made from high carbon steel, heat treated, and yellow dichromate plated. 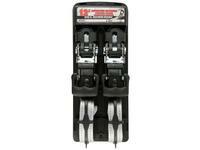 Erickson 58516 Heavy Duty Ratchet Strap 3" x 30' - 15,000 lb.